Attar, F., Mozaffarian, V., & Mirtadzadini, M. (2016). Cousinia brevicaulis sp. nov.(sect. Lasiandra) for the flora of Iran. Nordic Journal of Botany, 34(2), 174-177. Moradi, H., Naqinezhad, A., Siadati, S., Yousefi, Y., Attar, F. , Etemad, V. , Reif, A. (2016): Elevational gradient and vegetation-environmental relationships in the central Caspian forests of northern Iran. Nordic Journal of Botany 34(1): 1-14. Sotoodeh, A., Attar, F., & Civeyrel, L. (2016). A new species of Verbascum L.(Scrophulariaceae) from the Gilan province (Iran), based on morphological and molecular evidences. Adansonia, 38(1), 127-132. Eftekharian, R., Sheidai, M., Attar, F., & Noormohammadi, Z. (2015). Genetic diversity and population structure in Senecio leucanthemifolius subsp. vernalis (Asteraceae) in Iran. Phytologia Balcanica: International Journal of Balkan Flora and Vegetation, 21(2), 139-148. Faghir, Marzieh Beygom, et al., (2015). “Pollen morphology of the genus Alchemilla L.(Rosaceae) in Iran.” Turkish Journal of Botany 39.2: 267-279. Minaeifar, A. A., Sheidai, M., & Attar, F. 2015. Genetic and morphological diversity in Cousinia cylindracea (Asteraceae) populations: Identification of gene pools. BIODIVERSITAS 16 (2): 288-294. Minaeifar, A. A., Sheidai, M., Attar, F., Noormohammadi, Z., & Ghasemzadeh-Baraki, B. (2015). Genetic and morphological diversity in Cousinia tabrisiana (Asteraceae) populations. Biologia, 70(3), 328-338. Sotoodeh A., L. Civeyrel, F. Attar (2015). Verbascum shahsavarensis (Scrophulariaceae), a new species for Flora of Iran. Phytotaxa, 203: 76-80. Zamani, A., Attar, F., & Civeyrel, L. (2015). Leaf epidermis characters of Iranian Pyrus L.(Rosaceae) and their taxonomic implications. Genetic Resources and Crop Evolution, 1-18. Djavadi, S. B., & Attar, F. (2014). New chromosome counts in the genus Cousinia (Asteraceae, Cardueae) from Iran. Willdenowia, 40(2), 351-357. Sotoodeh, A., Civeyrel, L., Attar, F., & Zamani, A. (2014). Verbascum oreophilum var. oreophilum and Verbascum cheiranthifolium var. asperulum (Scrophulariaceae) two new records for the flora of Iran. Phytotaxa, 178(3), 205-210. Vajari, K. A., Veiskarami, G., & Attar, F. (2014). 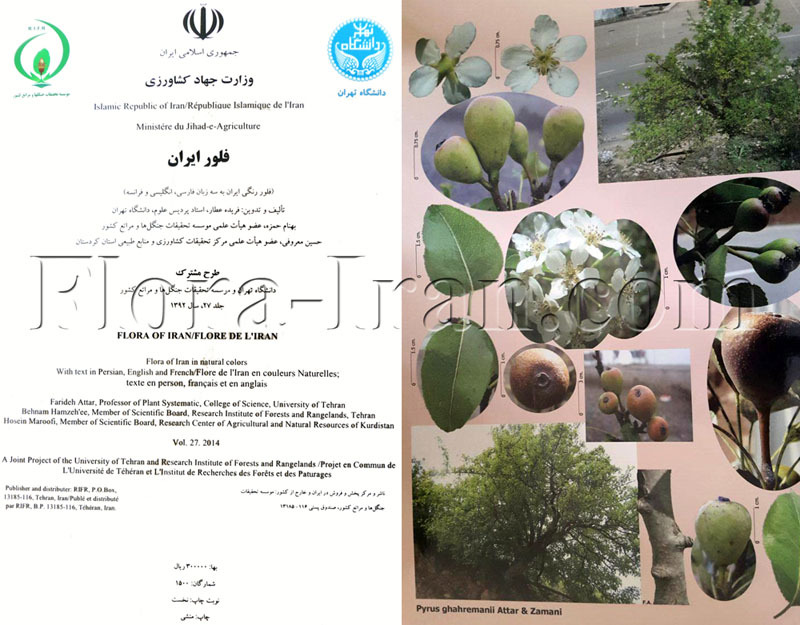 Recognition of Endemic Plants in Zagros Region (Case Study: Lorestan Province, Iran). Ecologia Balkanica, 6(1). Siadati, S., Moradi, H., Attar,F., Etemad,V., Hamzeh’ee, B., Naqinezhad, A. (2012): Botanical diversity of Hyrcanian forests; a case study of a transect in the Kheyrud protected lowland mountain forests in northern Iran . Phytotaxa 7: 1-18. Khansari, E., Zarre, S., Alizadeh, K., Attar, F., Aghabeigi, F., & Salmaki, Y. (2012). Pollen morphology of Campanula (Campanulaceae) and allied genera in Iran with special focus on its systematic implication. Flora-Morphology, Distribution, Functional Ecology of Plants, 207(3), 203-211. Naqinezhad, A., Esmaeili, S.H., Bahari, H., Gholizadeh, H., Ghahremaninejad, F., Hamzehee, B., Djamali, M. and Moradi, H. (2010): Phytososiological survey of lowland Caspian (Hyrcanian) forests, N. Iran, toward validation of some forest syntax . Phytologia Balcanica 18(2): 173-186. Attar, F., & Ghahreman, A., 2007: Cousinia aligudarzensis (Asteraceae), a new species of section Cynaroides Bunge from Iran. Novon, vol. 17, no. 2: 145-147. Attar, F., Ghahreman, A., Mahdigholi, K. & Sheidaii, M., 2007: A Synopsis of Cousinia sect. Serratuloides (Asteraceae) in Iran. Novon, vol. 17, no. 1: 1-7. Shahverdi Ahmad Reza, Khorramizadeh, Attar, Saadat, Vahid & Ghahreman, 2007: Concomitant chemopreventive and antibacterial effects of some Iranian plants from the genus Cousinia (Asteraceae). Brazilian Journal of Pharmacognosy, 17 (3). Shahverdi, A. , Khoramizadeh M. R., Ghahremani M.H., Golyaee, Ar. , Attar F. & Ghahreman A., 2007: Chemopreventive effect of Cousinia shulabadensis Attar & Ghahreman Etanol Extract, Afr. J. Trak. Cam, 4(1): 12-16. Hamzeh’ee, B., Alemi, M., Attar, F. & Ghahreman, A., 2007, Bromus catharticus Vahl and Bromus danthoniae var. uniaristatus (Poaceae), two new records from Iran. Attar, F. & Ghahreman, A., 2006: A synopsis of sect. Cynaroides (Cousinia, Compositae), distribution patterns and diversity centers. Rostaniha, vol. 7: 315-342. Ghahreman A., Alemi M.,Attar F., Hamzehee B., Columus J.T., 2006. Anatomical studies in some species of bromus L.(Poaceae) in iran Iran. Journ. Bot.12(1)1-14 Tehran. Ghahreman, A., Naqui-nejad, Hamzeh’ee, B., Attar, F. & Assadi, M., 2006: The Flora of Threatened black alder forests in the Caspian lowlands, northern Iran. Rostaniha, vol. 7(1). Ghahreman, A., Nurbakhash, S.N., Mahdigholi, K., 2007: Pollen morphology of Artemisia L. (Asteraceae) in Iran. Iran. Journ. Bot. Eslami,B.,Ghahreman,A., Assadi,M.,shahsavari,A.,Attar,F. and Hamzehii,B.2005:Vegetation changes along a precipation gradient in -Gaduk, Firuskooh(N.Iran).Jou.of enviro.studi36:57-76. Eslami,B.,Ghahreman,A., Assadi,M.,shahsavari,A.,Attar,F. and Hamzehii,B. 2005: Vegetation changes along a precipation gradient in -Gaduk, Firuskooh(N.Iran).Jou.of enviro.studi36:57-76. Sheidai, M., Mahdigholi, K.,Ghahreman, A. & Attar, F., 2005: Cytogenetic study of the genus Cousinia (Asteraceae) sect. Serratuloideae in Iran, Genetics and Molecular Biology. Attar F., Ghahreman A., Saber A., Zarre Sh. 2004 : A New Spacies of the qenus Cosinia (Compositae, Sect. Stenocephalae) from SW of Iran. Journ. Bot.11(1)65-70.Tehran. Attar F., Hamzehee B., Ghahreman A. 2004 10 10: A Contribution to the flora of Qeshm Island.-Iran. Journ. Bot.10(2)199-218.Tehran. Ghahreman, A., Naqinezhad, A. R. & Attar, F.. 2004 Habitats and flora of the Chamkhaleh-Jirbagh coastline and Amirkelayeh wetland. Journal of Environmental Studies: vol. 33: 46-67. Naqinezhad,A..R., Ghahreman A. Assadi M. 2004: Some New Record Species for the Flora of Iran as Well as Ecological and Phytogeographical Notes. Journ. Bot.11(1)89-96.Tehran. Nazarian, H., Ghahreman, A., Atri, M. and Assadi, M. 2004. An introduction to the forest associations of Elika Ecoton area, N Iran. Pak. Journal of Botany. Nazarian, H., Ghahreman, A., Atri, M. and Assadi, M. 2004. Ecological factors, affecting parts of vegetation in North Iran (Elika and Duna Watersheds) by employing eco-phytosociological method. Pak. J. Bot. 36 (1): 41-64. Attar, A., Ghahreman, A. & Assadi, M., 2003: Cousinia zagrica (Astraceae) a new species from west of Iran. Sendtnera 8: 5-7. Ghahreman, A., Mehdigholi, K., Nejadsattari, T. and Attar, F. 2003. A preliminary study of moss flora of Golestan province and comparison with Iranian mosses.- Iran. Journ. Bot. 10 (1): 63-81. Attar, F. & Ghahreman, A. 2002: New taxa of genus Cousinia from Iran. Iran. Journ. Bot. 9 (2): 161-169. Diafari, A., Ghahreman, A. & Maassoumi, AA. 2002: Investigation on stem cross section and wood analysis kinds of gun producerAstragalus L. species in Iran. Pajouhesh-va-Sazandegi 14 (3): 34-37. Ghahreman, A., Maassoumi, A. A. & Ghahremaninejad, F., 2002: Astragalus tuehensis (Fabaceae), a new species from Iran. Novon, 12: 47-49. Mozaffarian, V. & Ghahreman, A. 2002: A new species of Echinops L. (Sect. Oligolepis Bunge) from Iran. Pak. J. Bot., 34 (1): 23-25. Mozaffarian, V. & Ghahreman, A. 2002: Three new species of Echinops (Compositae, Cynareae) from Iran. Bot. Linn. Soc.140, 181-186. Naqinezhad, A. & Ghahreman, A. 2002: Two new records of Cyperaceae from Iran. Iran. Journ. Bot. 9 (2): 171-175. Pakravan, M. & Ghahreman, A. 2003: Some new combination and synonyms in Alcea from Iran. Ann. Naturhist. Mus. Wien. B., 104: 713-716. Pakravan, M. 7 Ghahreman, A. 2002: New records of Alcea for flora of Iran. Iran. Journ. Bot. 9 (2): 245-247. Saeidi-Mehrvarz, Sh & Ghahreman, A. 2002: A new species of Veronica from Iran. Nordic Journal of Botany, vol. 21 (6) 581-583. Saeidi-Mehrvarz, Sh, Ghahreman, A. & Assadi, M, 2002, NEW COLLECTION OF RARE SPECIES OF VERONICA IN IRAN,J. Bot. 9 (2): 191-193. Alai, E. & Ghahreman, A. 2001: Notes on the distribution, climate and flora of the oil field areas, SW of Iran. Iranian International Journal Science 2 (1): 15-32. Alai, E. & Ghahreman, A. 2001: Studies on halophyte of the oil field areas, SW Iran: I. Distribution and floristic composition. Journal of Environmental Studies, vol. 26: 1-11. Alaie, E., Ghahreman, A. & Mohajerani, B., 2001: Florestic studing in oil field areas SW Iran. Journal of Environmental Studies, vol. 25: 9-36. Attar, F., Ghahreman, A. & Assadi. M., 2001: Three new species of the genus Cousinia Cass. (Astraceae: sect. Cynaroidae) from Iran. Nordic Journal of Botany, vol. 20 (6): 697-700. Kukkonen, I., Ghahreman, A. & Naqinezhad, A. R., 2001: Isolepis cernuta (Cyperaceae), a new record from north of Iran. Iran. Journ. Bot. 9 (1): 107-110. Saeidi-Mehrvarz, Sh, Ghahreman, A. & Assadi, M., 2001: Notes in genus Veronica (Scrophulariceae: Veroniceae) in Iran. Pakistan Journal of Botany, vol. 33. Sahebi, J., Ghahreman, A. & Rahiminejad, M.R., 2001: A morphologic and taxonomic study of Hordeum murinum sensu lato (Poaceae: Triticeae) in Iran. Pakistan Journal of Botany, vol. 33. Attar, F. & Ghahreman, A. 2000: Two new species and a new record of the genus Cousinia Cass., sect. Cynaroideae (Astraceae) from Iran. Iran. Journ. Bot. 8 (2): 259-269. Ghaffari, S.M., Attar, F. & Ghahreman, A. 2000: Distribiution and chromosome studies on some species of Cousinia Cass. (sect.Cynaroideae) from Iran. Pakistan Journal of Botany, vol. 32 (2): 311-316. Ghahreman , A. , Pakravan, M. & Assadi, M. 2000: A new species of Alcea L. (Malvaceae) from Iran. Nordic Journal of Botany 20 (4). Ghahreman, A. & Mirtadzadini, M. 2000: Two new species of the genera Jurinea and Scrophulariaceae from southeast of Iran.Iran. Journ. Bot. 8 (2): 245-250. Ghahreman, A. & Veiskarami, Gh. H. 2000: Two new records for Iran: Bergia aquatica and Ammannia verticillata. Iran. Journ. Bot. 8 (2): 255-258. Ghahreman, A. & Attar, F. 2000: Biodiversity of plant species in Tehran Megapolis, Tehran University publication, Tehran. Ghahreman, A. & Attar, F. 2000: New report of three endangered species of Centaurea (sect. Cynaroidae, Astraceae) from Iran. Iran. Journ. Bot. 8 (2): 299-302. Maassoumi, A. A., Ghahremaninejad, F. & Ghahreman, A. 2000: Astragalus moussavii (Fabaceae), a new species of Astragalussect. Xiphidium from Iran, with supplementary notes on the section. Nordic Journal of Botany 20 (4). Ghahreman, A., Iranshar, M. & Attar, F. 1999: Introducing two new and a rare species of the genus Cousinia Cass. Sect.Cynaroideae (Asteraceae). Iran. Journ. Bot. 8 (1): 15-22. Ghahreman, A., Khatamsaz, M. & Ganj-Karimi, M. 1999: Leaf epidermal studies in the genus Hyoscyamus L. (Solanaceae) in Iran. Iran. Journ. Bot. 8 (1): 81-90. Maassoumi, A. A., Ghahreman, A., Ghahremaninejad, F. & Matin, F. 1999: Astragalus gigantirustratus (Fabaceae), a remarkable new species from N. Iran and supplementary notes on A. sect. Cytisodes Bunge. Willdenowia 29: 221-225. Safaeepour, J. & Ghahreman, A. 1997: The morphologic and anatomic comparative studies between Aegilops species andTriticum, Agropyron of Iran. Journal of Science, Al-Zahra University, No: 2:17-23. Ghahreman, A. & Amin, Gh.. 1996: Anatomical study of Diplotaenia damavandica (Umbelliferae).Iran. Journ. Bot. 7 (1) 73-79. Ghahreman, A. & Attar, F. 1996: A florestic study report concerning Qeshm Island- Iran- Journ. Bot. 7(1): 57-62. Ghahreman, A. & Attar, F. 1996: A new species of the genus Onosma from W. Iran. Iran- Journ. Bot. 7(1): 51-55. Ghahreman, A. & Khatamsaz, M. 1996: The genus Hyoscyamus L. (Solanaceae) in Iran. Iran. Journ. Bot. 7 (1) 31-37. Ghahreman, A. & Maassoumi, A. A. & Pakravan, M. 1996: Notes on the genus Astragalus L. (sect. Xiphidium Bunge) in Iran. Iran. Journ. Bot. 7 (1) 45-50. Ghahreman , A. & Zarreh, sh. 1994: A new interesting species of Astragalus L. sect. Acidodes Bunge (Fabaceae) from Iran. Sentnera 2: 283-285. Moussavi, M., Ghahreman, A., Attar, F. 1993: A new species of Galium (Rubiaceae) from Iran. Iran. Journ. Bot. 6(1): 145-147. Ghahreman, A. & Alam, H. 1989: Botanical studies on Iran, iii. Persian studies in the Western tracition. Encyclopaedia Iranical vol. IV Fasc. 4,399-401, Routledge and Kegan Paul, Ltd New York. Ghahreman, A. Ramak Massoumi, A.A. & Mozaffarian, V. 1988: A new species of the genus Astragalus, Sect. Tricholobus(Leguminosae) from Iran. Iran. Journ. Bot. 4(1): pp. 109-110 Tehran. Ghahreman, A. 1983: Arum giganteum (Araceae), a new species from W. Iran-Iran. Journ.. Bot. 2(1): 79-81 Tehran. Ghahreman, A., Aynehchi, Y., Salehi sormaghi, M. & Amin, Gh. 1981: Survey of Iranian plants for Saponins, Alkaloids, Flavonoids and tannins. I-Quart. J. Crude Drug Res. L, NO. 2-3, pp. 53-63. Ghahreman, A. & Sanei chariat –panahi, M.1979: une espece nouvelle de Typha (Typhaceae) en Iran-Bul. Soc. Bot. Fr., 126, lettres. Bot. (3), 373-375. Ghahreman, A. & Mobayen, S. 1978: Une nouvelle espece du genre Origanum de la region caspienne de l’Iran-Bull. Soc. Bot. Fr., 125, 389- 390. Ghahreman, A. & Yassini, I. 1976: Recapitulation de la Distribution des ostracodes et des Foraminiferes du lagon de Pahlavi, province de Gilan, Iran du Nord. Revue de Micropaleontologie vol. 19, NO. 3, pp, 172- 190. Ghahreman, A. 1974: General report on the Ecology of the Amir Kolayeh (Lagoon) vegetations. The suggested articles in the second Congress of the Iranian biologist society. (in Farsi). Ghahreman, A.1974: Deux nouvellos especes d’ Ephedra (Ephedraceae) d’ lran-Bull. Jard. Bot. nat Belg. Nat. Plantentuim Belg. 44: 23-28. Ghahreman, A.1971: Knowledge of plant science from the ancient time up to computer Machine. Talash Magazine, No.30. P. 52-57. (in Farsi). Ghahreman, A. & Attar, F., 1999: Biodiversity of plant species in Iran, vol. 1, Tehran University Publication, Tehran. Ghahreman, A. 1974: Anatomy of Tracheaophyta vol. 1: Plant tissues (in Persian) No.145, Tehran University Press. Ghahreman, A. 1975: Botanique Generale-Anatom. Morphologie et notions Generales sur groupes principalrd des vegetaux. Tome I. (in Persian). Ghahreman, A. 1975: Botanique Generale-Reproduction dans e Mond vegetal et Reciprocite de F’Action vegetale de du Milieu Environment Tome II. (in Persian). Ghahreman, A. 1978: Flora of Iran / Flore de l’Iran en couleurs naturalles. vol. 1. Publié par: la Societe Nationale Pour la Conservation des Ressources Naturelles et de l Enviromnent Humain. Tehran. Ghahreman, A. 1981: Flora of Iran / Flore de l’Iran en couleurs naturalles. vol. 2 . Iran University Press et Department of Environment. Tehran. Ghahreman, A. 1982: Code jenerale les Familles et les genres de la Flora de l’Iran. Institute des Researches des Forest at des paturages departement Botanique No. 29, 1-60. Ghahreman, A. 1982: Flora of Iran / Flore de l’Iran en couleurs naturalles. vol. 3 . Publié par: institute des recherches des Forests et des paturage Departement Botanique. Tehran. Ghahreman, A. 1983: Flora of Iran / Flore de l’Iran en couleurs naturalles. vol. 4 . Publié par: institute des recherches des Forests et des paturage Departement Botanique. Tehran. Ghahreman, A. 1984: Flora of Iran / Flore de l’Iran en couleurs naturalles. vol. 5 . Publié par: institute des recherches des Forests et des paturage Departement Botanique. Tehran. Ghahreman, A. 1985: Flora of Iran / Flore de l’Iran en couleurs naturalles. vol. 6 . Publié par: institute des recherches des Forests et des paturage Departement Botanique. Tehran. Ghahreman, A. 1986: Flora of Iran / Flore de l’Iran en couleurs naturalles. vol. 7 . Publié par: institute des recherches des Forests et des paturage Departement Botanique. Tehran. Ghahreman, A. 1987: Flora of Iran / Flore de l’Iran en couleurs naturalles. vol. 8 . Publié par: institute des recherches des Forests et des paturage Departement Botanique. Tehran. Ghahreman, A. 1987: Flora of Iran / Flore de l’Iran en couleurs naturalles. vol. 9 . Publié par: institute des recherches des Forests et des paturage Departement Botanique. Tehran. Ghahreman, A. 1988: Flora of Iran / Flore de l’Iran en couleurs naturalles. vol. 10. Publié par: institute des recherches des Forests et des paturage Departement Botanique. Tehran. Ghahreman, A. 1989: Flora of Iran / Flore de l’Iran en couleurs naturalles. vol. 11. Publié par: institute des recherches des Forests et des paturage Departement Botanique. Tehran. Ghahreman, A. 1990: Plant systematic coromophytes of Iran. Vol. 1. Tehran. Iran university press. Ghahreman, A. 1993: Flora of Iran / Flore de l’Iran en couleurs naturalles. vol. 12. Publié par: institute des recherches des Forests et des paturage Departement Botanique. Tehran. Ghahreman, A. 1993: Plant systematics: Cormophytes of Iran vol. 2, Iran University Press. Ghahreman, A. 1994: Basic Botany vol. 1, Tehran University Press. Ghahreman, A. 1994: Basic Botany vol. 2, Tehran University Press. Ghahreman, A. 1994: Flora of Iran / Flore de l’Iran en couleurs naturalles. vol. 13. Publié par: institute des recherches des Forests et des paturage Departement Botanique. Tehran. Ghahreman, A. 1994: Plante Systematics: Cormophytes of Iran vol. 3, Iran Universit Press. Ghahreman, A. 1994: Plante Systematics: Cormophytes of Iran Vol. 4, Iran Universit Press. Ghahreman, A. 1995: Flora of Iran / Flore de l’Iran en couleurs naturalles. vol. 14. Publié par: institute des recherches des Forests et des paturage Departement Botanique. Tehran. Ghahreman, A. 1995: Flora of Iran / Flore de l’Iran en couleurs naturalles. vol. 15. Publié par: institute des recherches des Forests et des paturage Departement Botanique. Tehran. Ghahreman, A. 1995: Plant systematics: Cormophytes of Iran vol. 4, Iran Universit Press. Ghahreman, A. 1996: General code of the families & genera of the flora of Iran. Research Institute of Forestes and Rangelands. Tehran. Ghahreman, A. 1996: Index to the scientific names of the 2000 plants presented flora of Iran in natural colors. Research Institute of Forestes and Rangelands. Tehran. Ghahreman, A. 1997: Flora of Iran / Flore de l’Iran en couleurs naturalles. vol. 16. Publié par: institute des recherches des Forests et des paturage Departement Botanique. Tehran. Ghahreman, A. 1998: Flora of Iran / Flore de l’Iran en couleurs naturalles. vol. 17. Publié par: institute des recherches des Forests et des paturage Departement Botanique. Tehran. Ghahreman, A. 1999: Flora of Iran / Flore de l’Iran en couleurs naturalles. vol. 18. Publié par: institute des recherches des Forests et des paturage Departement Botanique. Tehran. Ghahreman, A. 1999: Flora of Iran / Flore de l’Iran en couleurs naturalles. vol. 19. Publié par: institute des recherches des Forests et des paturage Departement Botanique. Tehran. Ghahreman, A. 2000: Flora of Iran / Flore de l’Iran en couleurs naturalles. vol. 20. Publié par: institute des recherches des Forests et des paturage Departement Botanique. Tehran. Ghahreman, A. 2001: Flora of Iran / Flore de l’Iran en couleurs naturalles. vol. 21. Publié par: institute des recherches des Forests et des paturage Departement Botanique. Tehran. Ghahreman, A. 2001: Flora of Iran / Flore de l’Iran en couleurs naturalles. vol. 22. Publié par: institute des recherches des Forests et des paturage Departement Botanique. Tehran. Ghahreman, A. 2002, Flora of Iran / Flore de l’Iran en couleurs naturalles. vol. 23. Publié par: institute des recherches des Forests et des paturage Departement Botanique. Tehran. Ghahreman, A. 2003, Flora of Iran / Flore de l’Iran en couleurs naturalles. vol. 24. Publié par: institute des recherches des Forests et des paturage Departement Botanique. Tehran. Ghahreman, A. 2003: Flora of Iran / Flore de l’Iran en couleurs naturalles. vol. 24. Publié par: institute des recherches des Forests et des paturage Departement Botanique. Tehran. Ghahreman, A. 2006: Basic Botany vol. 3, Plant Classification System Angiosperms Systematic, Tehran University Press. Ghahreman, A. 2006: Flora of Iran / Flore de l’Iran en couleurs naturalles. vol. 25. Publié par: institute des recherches des Forests et des paturage Departement Botanique. Tehran. Ghahreman, A., B. Hamzeh’ee & Attar, F., 2007. Natural Vegetation Map of the Kish Island, K.F.A. Organization. Ghahreman, A., Behnam Hamzeh’ee & F. Attar, 2000: Natural Vegetation Map of the Qeshm Island, Q.F.A. Organization. Ghahreman, A., Hamzeh’ee, B. & Attar, F. 2000: Natural Vegetation Map of the Qeshem Island. Q.F.A. Organization & Central Herbarium of Tehran University. Tehran. Ghahreman, A. & F. Attar, 2002: Biodiversity of Plant species in Tehran Megalopolis. Tehran University press. Saide, Attar, Hamdi, Sharif Nia, Assadi, Nanaid, Mehregan. 2011. Flore Iran, Scrophulariaceae.